Foreign Employment Minister Thalatha Athukorale was offered the ‘Woman of the Year’ award at the Top “50” Professional and Career Women Awards Sri Lanka 2017 on July 14. The International Finance Cooperating Institute presented this award to Athukorale in recognition of the services rendered by her towards the welfare and progress of expatriate workers abroad. 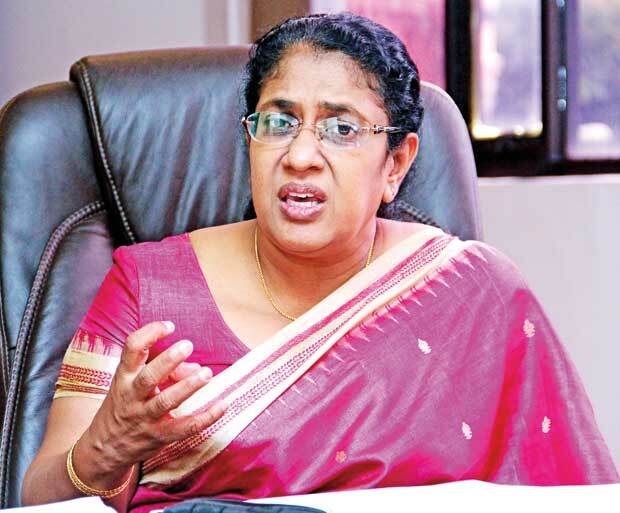 Attorney at Law Thalatha Athukorale entered the political arena following the demise of her brother Gamini Athukorale. In an interview with the Daily Mirror, she spoke about the issues pertaining to the foreign employment sector, especially touching on the housemaids crisis where Sri Lankans are employed abroad. "Once housemaids have gone they have to be there for two years according to the agreement. Most of the migrant workers are from the grassroots level"
There is an allegation that the ministry hasn’t been able to protect poor people who get hoodwinked by fake agents into paying large sums of money on the promise of jobs in various countries. We can’t control it single-handedly. The general public must be aware of unpleasant experiences of others who were hoodwinked by bogus agents. The ministry and Bureau are publicizing such incidents to prevent them from recurring. Anyone who seeks a job opportunity abroad can contact our officers deployed around the country and obtain advice anytime. In the cases of corrupt practices, where only money is concerned, people also have a responsibility to be vigilant. We imposed a regulation that women who have children under the age of five can’t migrate. A family background report is a must now. Unfortunately, some try to bribe officers and get a fake family background report which makes it easier for them to get approval from the Bureau. Our investigation unit operating under the Bureau is doing a great job in curbing illegal departures and checking on bogus foreign employment agencies. Seventeen officers from the Sri Lanka Police are serving this unit. I can be happy now because I know that illegal activities which were taking place on a very large scale are now minimized. "Our investigation unit operating under the Bureau is doing a great job in curbing illegal departures and checking on bogus foreign employment agencies. Seventeen officers from the Sri Lanka Police are serving this unit"
Recently, you came under fire over an agreement signed between Sri Lanka and the Saudi Arabian Government. The Association of Licensed Foreign Employment Agencies claimed that the government is projected to lose nearly Rs. 4.5 billion income due to a new agreement that’ll send housemaids to the Kingdom of Saudi Arabia. Can you clear your stance on this matter? That is all nonsense. I never signed an agreement with the Saudi Arabian Government. This isn’t my private business for me to decide everything. Whatever I decide, it’s with the consultation of Ministry Secretary and other officers of the ministry. But, when some other country imposes conditions with regard to foreign employment, we have to agree with them. We can’t decide how to send our women to Saudi for housemaids’ jobs. It’s the Saudi Arabian Government that should decide about it. There has been a disturbing number of reports revealing that Sri Lankan maids face inhuman treatment in the Gulf countries. Are you contemplating any action to minimize or stop sending our maids to SA? Once housemaids have gone they have to be there for two years according to the agreement. Most of the migrant workers are from the grassroots level. They have no knowledge about the countries they are going to work in. We are trying to make them understand that wherever they are going to is different from Sri Lanka. They have to be aware that society, culture, environment and the laws are different from those in our country. With the aim of providing them with a better training programme before departure, I have taken steps to expand the duration of the training programme. As we take all measures to make the housemaids aware of their obligations, they must be able to adjust themselves accordingly. You can’t blame the government because people have a responsibility. In the mean time, we need to send skilled workers as much as possible. Isn’t the lack of language skills one of the biggest difficulties our migrant workers, especially housemaids are facing? We send local workers to nearly about 18 countries worldwide. Recently, a USA job recruitment company visited Sri Lanka to recruit caregivers and nurses to work in the USA. They interviewed our women and selected only three women who had passed the interviews. Three weren’t enough for them, so they just left. The language problem is a big barrier. In order to overcome it, maybe from January 2018 onwards, everybody will have to sit for an exam where language skills will be tested in keeping with the standards expected by the countries they expect to migrate to. If the government could develop industries in the country, producing new job opportunities, the country doesn’t need to be dependent on foreign exchange received from housemaids employed in the Gulf. What is you take on this? My personal wish isn’t to send any woman as a housemaid abroad. However, for the past ten years, the country has been dependent only on income earned through foreign employment, especially in Gulf region. Our agriculture sector was destroyed and the garment sector was discouraged under the previous government. Nearly 500,000 women lost their jobs in the garment sector. As a result, most women who worked in garments took up opportunities as housemaids. No one should expect a sudden change anytime soon. I can’t stop it overnight. It will take at least 10 years. We are trying to send only qualified workers. We have ruled National Vocations Qualification (NVQ) level standards for migrant workers. The Ministry of Vocational Training and Ministry of Foreign Employment are working hand in hand in this task. Many problems pertaining to the foreign employment sector have existed. It’s been just two years after we were appointed. Some issues still have to be addressed. I can’t do wonders within two years. I will try my best. It’s my duty. I need a little more time to make the changes. For the past two years, there were a number of new programmes launched by the Bureau with regard to housemaids. Is there a **diminution in the number of women seeking housemaid jobs? Yes. There is a decrease in the number of local women migrating for housemaids’ jobs in the Middle East. It’s a result of our strict programme at the Bureau against illegal departures. At the same time, we have noticed that the demand for housemaids in the Gulf has considerably decreased. The income earned by the Bureau had also been decreased according to Central Bank reports. As a government, of course it needs foreign exchange. Our government isn’t of the view that foreign exchange through housemaids should be the main income. Currently, the government is considering the agriculture sector which can be promoted and used as a good way of obtaining foreign exchange through export products. The government will be able to receive more money by focusing on resources which can be developed within the country. "Yes. There is a decrease in the number of local women migrating for housemaids’ jobs in the Middle East. It’s a result of our strict programme at the Bureau against illegal departures"
The current government obtained power making many promises; especially good governance, freeing the country of corruption and the prosecution of murderers and wrongdoers. What has been the outcome of these policies so far? I won’t say it’s a hundred percent change. People have freedom of expression that’s present in the country. The judiciary is also acting without any pressure from this government. What else do we need changed? It takes a little time. I can assure you that the truth will prevail. Just because we try to suppress the situation, it won’t happen. I think there are around 300, 000 complaints regarding misdeeds that took place during the previous government. There are many files piled up at the Attorney General Department. There were even cases sans any evidence. Will you say the same thing at the end of six years !!!? Policy makers can do what ever for the public.The way you get perks with our Tax money. The legislature governs the country.Flimpsy excuses the get away for inefficiency. What did you do for last two years other than warming up your chair?? One time you said there will be a "Pension Scheme" soon for the Sri Lankan who works in abroad.What happen to that and when the "Pension Scheme" will be introduce? We didnt ask you to take up the job. If its too difficult, get out and let someone more capable handle these issues.